If the white man gives you anything – just remember when he gets ready he will take it right back. We have to take for ourselves. People have got to get together and work together. I’m tired of the kind of oppression that white people have inflicted on us and are still trying to inflict. Nobody’s free until everybody’s free. White Americans today don’t know what in the world to do because when they put us behind them, that’s where they made their mistake… they put us behind them, and we watched every move they made. 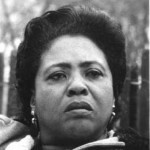 Fannie Lou Hamer was an American voting rights activist and civil rights leader. She was instrumental in organizing Mississippi Freedom Summer for the Student Nonviolent Coordinating Committee, and later became the Vice-Chair of the Mississippi Freedom Democratic Party, attending the 1964 Democratic National Convention in Atlantic City, New Jersey, in that capacity.